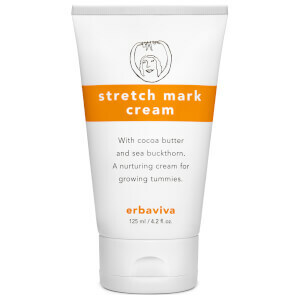 Meet the needs of stressed skin with the Erbaviva Stretch Mark Oil; a nutrient-rich solution that keeps mother’s skin soft, soothed and hydrated. Enriched with Carrot Seed oil, the silky formula improves skin’s elasticity, which allows the skin to stretch more smoothly during pregnancy and therefore reduce the likelihood of stretch marks. A blend of Rosemary, Rosehip and Vitamin E works as an anti-inflammatory to ensure skin remains calm and comfortable. Working on the tummy, breasts, thighs and hips, the fragrant oil envelops skin in aromatic nourishment. Expect to feel pampered and well cared for. Use during the 1st trimester before the skin begins to stretch. Apply liberal amounts of the oil to breast, belly, hips, and buttocks twice per day. Massage in a circular motion to encourage maximum absorption. *Prunus Amygdalus Dulcis (Almond) Oil, *Carthamus Tinctorius (Safflower) Oil, *Triticum Vulgare (Wheat Germ) Oil, *Rosa Canina (Rosehip) Oil, *Lavandula Angustifolia (Lavender) Flower Oil, *Rosmarinus Officinalis (Rosemary) Leaf Extract, *Helianthus Annuus (Sunflower) Oil, *Citrus Nobilis (Mandarin Orange) Peel Oil, *Daucus Carota Sativa (Carrot) Seed Oil, *Rosa Damascena (Rose) Flower Oil, *Santalum Spicatum (Sandalwood) Oil, Tocopherol (Vitamin E). *Denotes Certified Organic Ingredient. Use code FF25 at the cart to receive 25% off your order. Offer ends 4/22.